11. Sometimes men are such babies. I know that women are supposed to honor their husbands, and this sounds so disrespectful. But every woman on the planet knows that it’s true. I have often asked Ray how on earth he was in the military for so long (he served in the Navy for 14 years as a combat medic), has been a fireman and a fire chief, a police chief, and was on a SWAT team, busting down doors for drug raids, when he can be such a wimp sometimes. At the first sign of winter, he begins shivering hard and saying, “BRRRR! It’s co-o-o-ld!” I have to restrain myself from telling him to man up. I know, I am terrible. I think he’s doing it so I will be sympathetic, plug in the electric blanket, and bring him a cup of hot cocoa. 12. Appreciate his gifts. After you open a birthday, Christmas, or Valentine’s gift, be sure to let him know how thoughtful it was, even if it’s a present you don’t even like. Looking at it dubiously and asking, “What the heck is this? I am not going to use this!” is no way to woo your husband. (I promise, I only did this once.) And, worse, he won’t buy you any more presents after that! I am blessed in that Ray has always been SO GREAT at buying me presents. I warned him when we first married, to NEVER buy me presents like a toaster ~ no kitchen or “useful, practical” gifts! If he’s going to get me a present, get me something I want and love! Initially when we married, he gave me wonderful, romantic gifts like red roses, chocolates, an emerald and diamond ring, my birthday sapphire ring, a beautiful painting…now he knows I like more geeky gifts: an Ipod, a laptop, a smart phone. This week I told Ray how much I love my laptop, just as a reminder of my appreciation that he bought it for me for my birthday. Verbally express and show your appreciation for the little (and big) things your husband does for you. 13. Catch the little foxes. The Bible says in Song of Solomon 2:15 (NLT): “Catch all the foxes, those little foxes, before they ruin the vineyard of love, for the grapevines are blossoming!” In other words, stop arguing and having strife before it ruins your day ~ and destroys your marriage. Arguing over stupid stuff (as most arguments are) – “the little foxes” – can lead to world war fighting. In our cases, we have to watch out not only for the little foxes (bickering), but also for T-Rex dinosaurs! The Bible warns us that where there’s envy and strife, there’s confusion and every evil. Strife is rooted in pride, with each person thinking he or she is “right” and/or trying to prove a point. Some great advice I received years ago from a Biblical counselor was that as soon as strife started (or “intense domestic discussion,” as one friend jokingly calls it), to say out loud, “Strife break!”, holding up your hand like a stop sign ~ and then both partners walk away until you calm down and come back later to discuss it more rationally. Strife has done incredible damage to Ray’s and my marriage for 19 years. We are very different people and we’re both stubborn and hard-headed, so we could argue over the weather. I am finally learning the beauty and the power of just being quiet and not arguing. It works miracles! This isn’t easy for me to do, but I am asking God to help me with it every day. As my marriage counselor so wisely said, you can’t have strife alone. It takes two to tango. 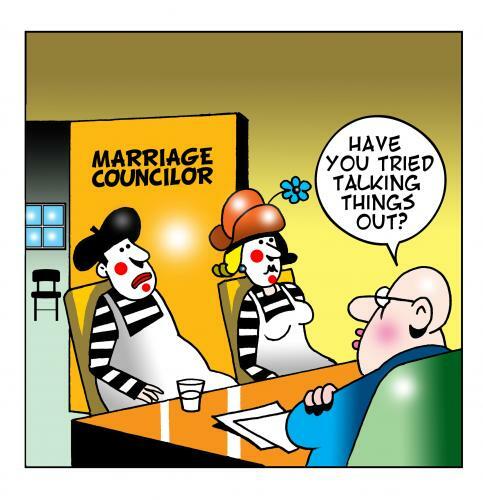 Try being quiet when your spouse is trying to provoke an argument and see if it helps your marriage. This doesn’t mean being a doormat or not speaking up when wrong is being done. But arguing over silly things is immature and a waste of precious time. God has a great purpose for your life (and your husband’s); don’t miss out on it through disobedience to God and day after day strife with your husband. 14. Dates and having fun are still a must! I believe this is one of the main reasons people divorce. They get caught up in the daily grind of working, taking care of the kids, paying bills, and forget to have fun anymore and learning about each other. You don’t have to spend a lot of money to date. You can just go for a walk at night looking up at the stars, go out to eat for lunch, go to a matinee like The Hunger Games, or watch a movie at home together when the kids are in bed. One of the things that makes me happier than anything else is going to eat Mexican or Mediterranean food with Ray and just talking. To me, that is a perfect date! I don’t need anything else to be happy. In the movie Fireproof, the two married men Caleb and Michael were discussing Caleb reading The Love Dare book and how it encouraged the husband to “study” his wife – with the ultimate goal of eventually getting a “Ph.D.” of education in knowing her. It’s the same with wives. How well do you know your husband? What are his likes, his dislikes? What bothers him, what causes does he believe in? What are his core values? What irritates him? What are his big dreams and has he achieved them yet? What is holding him back from those dreams? What is his favorite color, meal, sport, t.v. show, author, movie? Get to know your spouse again. Talk and go out again ~ without the kids. Ask your parents (or other children! ), friends, or neighbors to watch your kids. Barter with other couples for date nights or romantic weekend get-aways with your spouse. 15. Don’t diss his favorite people. It’s okay for him to be fed up with his parents, siblings, mentor, best friend, boss, or co-worker, but don’t you dare say something negative. This will actually serve to put him in the awkward position of having to defend them from you! Empathy is a powerful relationship builder; criticism is not. Remember blood is thicker than water, and friends can feel like blood kin to him, too. Just listen as he vents, without adding in your unasked-for, two cents.You don’t have to tell your husband everything you think! This is hard for women, especially if they see someone doing their husbands (or children or other loved ones) wrong. Because of women’s intuition and discernment, women often pick up on things faster than men, so you may have already seen the situation coming. Just extend compassion to him. If you can’t stand the people he hangs around, works for or with, or he knows, just pray about the situation. Smiling, being civil, and walking in the fruit of the Holy Spirit can disarm the worst offender. For this, you will need to stay prayed up and in God’s word. Let your husband know you’re on his side in support…not how you agree with his enemies how he just needs to get his act together. Stay tuned tomorrow for part 3 and the conclusion of this blog series!